In the late 1800s, Auguste Ponsot, a Frenchman, traveled through Armenia and noticed that many people fragranced and disinfected their homes and businesses by burning benzoin (a resin produced by trees of the genus Styrax). Personal and public hygiene were hot topics at the time in France, and Ponsot felt Europeans, too, could benefit from burning benzoin at home. Realizing most 'modern' European families would not go to the trouble of burning raw benzoin, he sought the help of a pharmacist, Henri Rivier, to come up with an easy way to burn the resin. Rivier dissolved raw benzoin in 90% alcohol, added some "secret" aromatics to the mixture, and soaked paper in the sweetly scented liquid. The paper was put through a saline bath to make it burn slowly. This fragrant paper was then burned and its smoke scented and cleansed the air. The new product was called Papier d’Arménie and became popular immediately. It has been produced for over 120 years in the Paris suburb of Montrouge. Benzoin is a perfume fixative that smells of vanilla; it possesses a sweet powdery scent that I find addictive. In the medical realm, benzoin has been used to alleviate depression, as an expectorant, and, most importantly for the Armenians and Ponsot, as an antiseptic and disinfectant. I possess a small bag of raw benzoin, so I decided to recreate Ponsot’s "eureka moment" — to revisit his inspiration. As I burned raw benzoin, a slightly medicinal sweetness filled the air. Slowly, a vanilla scent, smoky and rich, began to emerge. The softest 'wood' notes imaginable came at the end of the burn. One half hour after burning raw benzoin, the house smelled soapy-powdery-lovely. The scent of burning Papier d’Arménie is of harsh and rough incense. I sniffed the smoke up close and felt my nostrils had been chemically seared. (Next time I feel a cold coming on, I’ll attack the germs by inhaling some Papier d’Arménie smoke!) I left the tiny room where the burning took place and came back every 15 minutes or so and the scent of Papier d’Arménie was evident for a few hours. The after-burn aroma is pleasant (light vanilla with a touch of amber, incense), but not as silky and powdery as the after-burn perfume of raw benzoin. When I burned Papier d’Arménie in a large room, its effects were not so apparent or long-lasting. Burning Papier d’Arménie supposedly removes foul cooking and pet odors from the air. Unless the cooking odors you deal with most are burnt toast and boiled eggs, Papier d’Arménie won’t be of much use. It was helpless when faced with the heavy-duty smells of crab cakes and salmon, garlic-rich foods, and curries. If anyone has tried Santa Maria Novella’s Carta d’Armenia papers, Guerlain’s Bois d’Arménie or Francis Kurkdjian’s new fragrance for Papier d’Arménie (available in France thru Dec. 31, 2006), please comment. Papier d’Arménie is available at beautyhabit and many other Internet shops, including French Soaps on Amazon (the source of the picture shown above). The price for one booklet, containing 36 paper strips, is $6. See the Papier d’Arménie website for further information. We always had a small booklet of Papier d'Arménie at home when I was a child in France. The cover used to be dark green, I think, but otherwise it looked the same as in your illustration. My mother let me hold the strip of paper while it burned: it was always very thrilling. I love the smell. LOL! It does indeed: you have to let go quickly when it's threatening your fingers. What child doesn't like to play with fire?! I love Benzoin. One of my current prototype perfumes is based around Benzoin and Styrax (different products from the same plant, as I am sure you know). I'd love to try burning raw Benzoin one day! Thanks for the informative article. Well, when I get past prototype-stages and into some kind of production, I'll need product testers. But that's quite a way off yet. I am still experimenting and collecting materials, learning (and most recently, have been very fortunate indeed in gaining some private “tutoring” from two very skilled working perfumers). As for raw materials, I've been getting some supplier samples from the aforementioned perfumers, as well as buying online. I might check about the raw “tears”; I'm sure it won't be hard to get hold of. Kevin, how did you obtain your raw benzoin? And what method did you use to burn it? I have (and love) the Santa Maria Novella Carta d'Armenia Burning Papers, though I cannot compare them to the French version, but I do sense deep, resinous benzoin in them as well. I don't burn them usually, but use them as scented bookmarks. Guerlain's Bois d'Armenie is a gorgeous, gorgeous perfume, but it does not live up to the deepness or intensity of the CdA — it's more of a cuddly, cozy vanilla-incense-resin scent. Hope A will come back and answer you too, but butting in to say that the Guerlain doesn't strike me as too feminine for a man to wear. I got the tiniest sample you can imagine so only have the vaguest impression but I would call it only middling-sweet, and very well done. Want to get another try on skin before I decide if I want it (or would pay for it) — it is lighter than I expected. Either that or I just had so little on that I couldn't smell it properly, LOL…but a bit of patch doesn't usually bother me. I stumbled on this lovely review some time ago, searching for information on Guerlain’s Bois d’armenie. I got intrigued and am here to report on the different burning papers (original papier d’armenie and SMN carta d’armenia), just in case anyone else coming on this page has the same curiosity! The Pd’A is less than half the price for three times more burning strips than the SMN, and the smell is incense/vanillic, a bit bitter and sweet while burning, and a bit powdery-sweet once the burning is over. The papier d’armenie (4,5 euros) seems pretty much thin and streamlined compared to the SMN (12 Euros), which is truly magnificent, in my opinion. I still haven’t tried BdA, but if a perfume was made like the SMN scented strips, I would buy a stock. The SMN strips are the same size but thicker, and out of the box the smell is quite flowery and diffusive. But as they burn, they throw a wonderful smoky/balsamic/resinous/powdery/slightly-floral cloud, that all good perfumista is bound to enjoy. They burn much slower than the PdA, and their scent is much more powerful: half a SMN is enough to scent nicely my house (which is small), while I need at least a couple of PDA strips to reach the same effect. That’s already a factor of 4. And the Pd’A fade quickly. I own both Pd’A and SMN Cd’A, and enjoy both, but for once the different prices are totally justified. Thanks to Kevin, I discovered this new way of scenting my house: if like me incense sticks bother you after a while, and you love candles but you start coughing when they burn, scented strips will make you really very happy, at a fraction of the price of a good candle. I’m now curious to try the FK burning paper (those for his own house, and those he made for the original Pd’A line)… I got anew addiction, and for one, it is not too expensive!!! I have just returned from the US with a little booklet of wonderful Armenian papers recommended to me by my Aussie/American girlfriend who said that she used them to relieve to rhodesian ridgeback smell in her house over the long cold winter. I have brought them back to try and lessen the fermenting rankness emanating from two little pugs. I am stunned to read the price. I paid about $25 from a trendy perfumery in Chelsea. I won’t be caught again but my entire family absolutely love them. They remind me of a beautiful hotel in Paris that I recently stayed at. How heavenly! 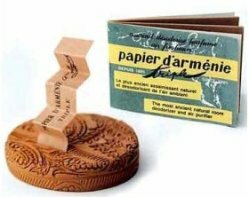 Papier d’Armenie is used in France, when Italians use Carta d’Eritrea which I like very much and desperately trying to find a perfume smelling like it, maybe someone knows?